Every year I go to ALA Annual Conference, I can think of no better way to finish it off than attending the Printz Awards Reception. Unlike the Newbery-Caldecott Banquet, all the honorees give a speech. They’re good authors, so you’re in for some eloquent speeches. The Printz Award is open to any English-language book, so you usually get to listen to some wonderful accents! One thing I enjoy about the Printz Reception: I get to see my YALSA friends, who weren’t necessarily at the earlier ALSC events I attended. (YALSA is for service to young adults, and ALSC for service to children. As a public librarian in Fairfax County, we have them grouped together in “Youth Services.”) I got to sit next to Liz Burns and got to talk to others at the reception. It was quite unfair that Benjamin Alire Saenz, author of Aristotle and Dante Discover the Secrets of the Universe went first, since he had much of the audience in tears with his heartfelt speech. I haven’t (yet) read Aristotle and Dante Discover the Secrets of the Universe, but I gather it’s about a boy discovering friendship and romance with another boy. Benjamin Alire Saenz said that this book was written out of his own journey, which was conflicted and difficult. He “came out” at 54. His character, Ari, is on the brink of manhood, but also on the brink of self-hatred. His characters’ fears and apprehensions too closely mirrored his own. He went on to thank the committee for choosing to honor this book. It was published on the day his mother died. So he wasn’t able to celebrate the book’s publication. Honoring Aristotle and Dante Discover the Secrets of the Universe gave him back his book and gave him a chance to celebrate it. This book makes people cry, but it also makes them laugh. The book was undertaken as a tribute to Henry Mayhew, who wrote London and the London Poor. The poor had freedom — to starve. These conferences are a great opportunity to share stories. Diversity can create walls or take down walls. People with disabilities don’t often travel in YA novels. Librarians make connections between people and reading. His theme involves Circles, which protect against the evil eye. To him, it’s about goodness. The magical power of the book is about the possibility of wonder in the everyday. The characters enter a liminal world and an adventure that changes them, followed by a return. The concept of the eternal return – time when direct communication with God was possible – We long for that time. We re-enact the eternal return by rituals and rites of passage. Rites of passage are about moving into the adult world. “Reading fiction is an example of the eternal return.” – Vicarious initiation rituals. And so, deeply inspired, we moved on to dessert — cupcakes and popcorn. It was a nice end to a fabulous conference! 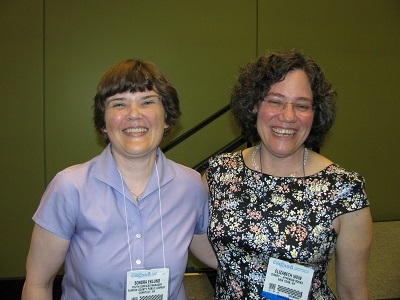 I’ve posted about almost all of ALA 2013 Annual Conference now. Still to report: One last day of meetings, and the Printz Awards Reception in the evening. 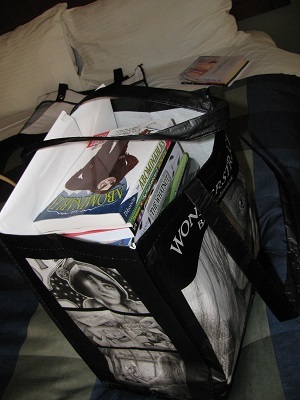 There was one thing from the Newbery/Caldecott/Wilder Banquet, however, that I didn’t notice until I was packing up to go home. I don’t know about your libraries, but at our library, we put out those golf pencils and have to replenish them every single day. They disappear because people take them without thinking about it. For the record, I did not throw it away! Monday morning, the first meeting I’d planned to attend was too packed to enter. So I headed for the ALSC Awards, which were scheduled a little later, so I was on time for a change! They award the Sibert Medal, the Carnegie Medal, the Batchelder Award, and the Geisel Award at this event. She began making films to spread awareness about the environment. “We can make a difference in the world. When the book was being translated, she only got to read a chapter at a time. It’s a story of duality, a girl who has nothing, but has everything. After a little time in the exhibits, I went to the ALSC membership meeting. That’s the children’s services division of ALA. Among other things, they talked about the Common Core and the importance of play. I’m a member of two other divisions — YALSA, for young adult librarians, and PLA, the public library association. But my heart is with ALSC, and that’s where I’m trying to get involved. I just finished two years on ALSC’s Children and Technology committee, and have begun serving on the Grant Administration committee. 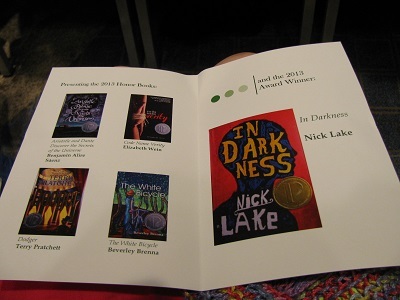 And I’m hoping that some day, somehow, I’ll get to serve on the Newbery committee. Then it was back to the exhibits. 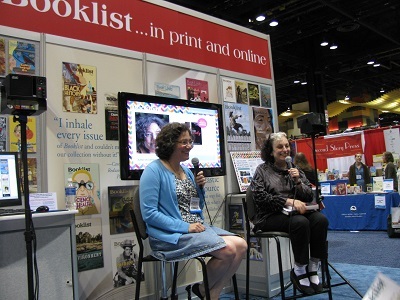 I went straight to the Booklist booth to hear Elizabeth Wein speak, but she wasn’t there yet. I heard that she was still signing — and I immediately went to find her, since I figured they might be giving out ARCs of her new book! 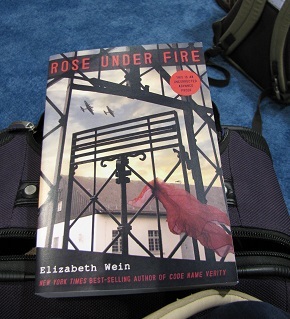 Sure enough, I didn’t get it signed, but I did snag a copy of Rose Under Fire! And then I got to hear Elizabeth Wein speak, so it was a Win-Win morning! At the Booklist interview, she talked about writing Rose Under Fire. Her introduction to Holocaust literature was the same as mine: reading The Hiding Place. She became obsessed with it. Both Code Name Verity and Rose Under Fire are based on a story she wrote when she was 12. The story was not written, but she made pictures. It started with spies and went on to a concentration camp, so Rose Under Fire is the second part of that. There’s a part of her that says, “I have no business telling this story.” But she didn’t deprive herself, because she knows her characters, and the real people they’re based on, wouldn’t wish that kind of hardship on anyone. Julie’s process of writing was very self-indulgent for Elizabeth Wein. She had to rein herself in for Maddie. The importance of poetry in Rose Under Fire comes from a survivor account. Each of her books is about something specific. “Fly the plane” comes from flight instructors. When you’re up there, you can’t think about anything else. There’s more of her in Rose than any other character she’s written. After that, I had lunch and then tried to get out of the exhibits. But I was pulled inexorably into the free books line at the Simon & Schuster booth. I got four free books (the EXACT number so that my brother Robert correctly guessed that I’d come home with 92 books), but then managed to NOT get back in line. The final program I attended was “Think with Your Eyes” about Visual Thinking. Image selection is a critical part of the process. “Provide a space where you have a multiplicity of right answers. You can also use this method with poetry. Kids get used to no wrong answers. Paraphrasing responses clarifies and validates. The hard part: Teaching educators to remain neutral. Participants learn that other people think differently than you. It’s very similar to the Scientific Method, only less directed. Meta-cognition — becoming aware of how you think. There’s not consensus, but everyone listens and hears the multiple perspectives. Find out more at the VTS website! The VTS images become more complex with time. Teaches silent looking — a valuable skill. Next speaker, a teacher, uses VTS with Caldecott books. I want to try those questions the next time I use a wordless book in a storytime. It’s a great model! Those were the books I got on Monday. So much restraint compared with the other days! The good news was that I got ALL the books except one into four Flat-Rate boxes and shipped them successfully. I was all ready to go to the last event, the Printz Awards Reception! 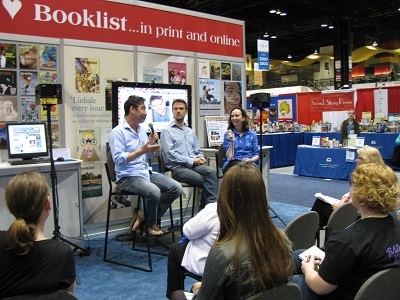 ALA 2013 – Saturday – Programs and Ideas and Authors, Oh My! 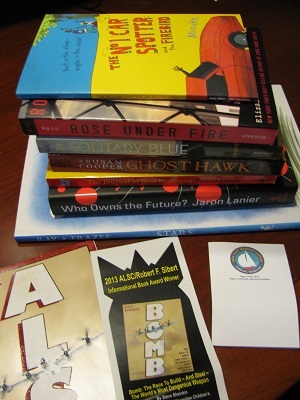 This is Part 4 of my summing up of the 2013 ALA Annual Conference. I’m up to Saturday, a day of some inspiring programs full of ideas I’d like to try. The day got off to an inauspicious start. I had carefully set the hotel alarm clock the night before. In the morning, I laid awake on the bed with my blindfold in place quite awhile, wondering why I’d woken so early. Finally, I looked at the clock and discovered it wasn’t so early after all. Though I’d set the alarm, I hadn’t actually turned it on. So I didn’t get to the convention center in time for the Collection Management session I’d planned to attend. However, it turned out I was right on time to attend the Scholastic Book Buzz. I’ve actually started trying to avoid the Book Buzz sessions — it just tells me about more books I want to read. But I still enjoy them. It’s fun to then go to the booth and ask for specific titles you saw in the program. For example, one that caught my eye was Marie Antoinette, Serial Killer, by Katie Alender. The premise simply makes me laugh — a modern-day teen in Paris discovers that Marie Antoinette’s ghost is haunting the city — and she’s angry. It makes sense. After all, wouldn’t she be angry? Next was a tough choice. I’d wanted to go hear Naomi Novik speak on a panel titled “Beyond Genre.” But I decided that more practical to my job would be a session put together by Cen Campbell, who’s served with me on ALSC’s Children and Technology committee, and who is doing amazing things. The session was called “Building A to Zoo for Apps,” and is about the need for App Advisory, and how that’s exactly something librarians are good at and should be doing. She had assembled a stellar panel of speakers. Clarissa Kruger writes a blog that reviews apps. She started as a mom who saw a gap. Parents are looking for ebooks and they need help. Other speakers talked about how librarians should get involved reviewing apps, and identify themselves as librarians when they do so (Sneaky outreach!). An especially inspiring speaker was Chip Donohue from the Fred Rogers Center. He said that the new tools hold wonderful potential for promoting relationships and interaction. We need to be the researchers. Edtech research lags 10 years behind technology. When we use apps in storytime, we’re modeling using them in an educational way. It’s important to build a professional learning network. Be prosumers (producers) as well as consumers. Shanna Miles talked about “PTSD and the Urban School Library” – Kids need reflective texts, books where they see themselves. Do characters speak, act, look, experience life like these kids? Do the books provide solutions and give hope? If they can live it, they can read it. Kim Ventrella, from my own library system, did a presentation on “Book Snacks: Teen Humor Edition.” She showed how you can make “booktweets” promoting a book in 140 characters or less. You can use this idea on bookmarks, book displays, and more. Jennifer Lau-Bond talked about Creativity in Reference Service Provision. She described “Predatory Reference” — What questions aren’t people asking? Go answer them! Had “Librarians on the Loose” at a train station. Monitor local social media questions. Where does your community go online? How can you contribute? “Given enough time, anything in science fiction is eventually proven wrong. Why this does not matter: It’s about the larger themes. “I grew up in a library.” The only child of a single parent, she was there every day for 3 hours. Today there’s big diversity in YA science fiction fans and writers. “The Rainbow Age of Science Fiction” – This is the factual world. It’s diverse. The job of science fiction writers isn’t futurism. 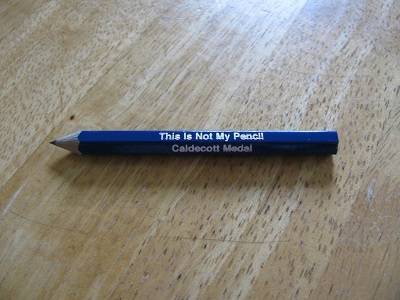 You don’t have to use metaphor. You can tackle issues thematically without oversimplification and didacticism. As a kid, he was often told to “be realistic.” What does that even mean? Approximate reality? He doesn’t think science fiction is extrapolative. It’s more like a petri dish. My friend (by now) James Kennedy was running this program. 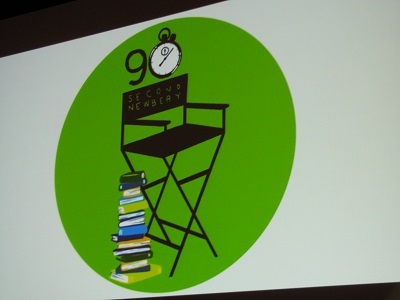 He talked about the 90-second Newbery Film Festival, now in its 3rd year. He showed lots of brilliant examples, created by kids. The premise is to show the entire story of a Newbery winner or honor book in 90 seconds. Much of the creativity comes in when they put the text in another movie style. Some advice for public libraries: Try using puppets in case the same people don’t show up at later meetings. I’d really like to get this going at my library. Not quite sure how to start rounding up a group of interested kids, but the ideas are percolating…. After that, I hit the exhibits again, shipped the day’s books, and then went to hear Elizabeth Wein speak at a session sponsored by USBBY. She’s an appropriate speaker for USBBY, a branch of IBBY, an international organization of books for youth, since she has lived in many different countries. She talked about her childhood. She was born in America, but lived as a child in the United Kingdom, and then in Jamaica. She didn’t come back to America until she was 9 years old. She showed us some old pictures and some of her writing and drawing as a child. We saw some themes that came up in Code Name Verity! She migrates like the osprey — not immigrating, but having a home in different places. She longed for a sense of place and a place to be rooted. She spends her life collecting places she loves. Living in Jamaica, she was international and colorblind in her early reading, including reading English translations of Chinese propaganda picture books. She wrote Sara Crewe and Alan Garner fan fiction. I was especially excited to meet Elizabeth at the end of the session. (That’s the picture at the top of this post.) I was happy that she knows my name. I’ve been reviewing (and loving) her books for 10 years! It turns out that the first book I read of hers, A Coalition of Lions was my #1 2003 Sonderbooks Stand-out in Historical Fiction. (Back then, there weren’t so many bloggers, so I even talked to her via e-mail a little bit.) And I’ve continued to love her books over the years. After that, it was back to the hotel. 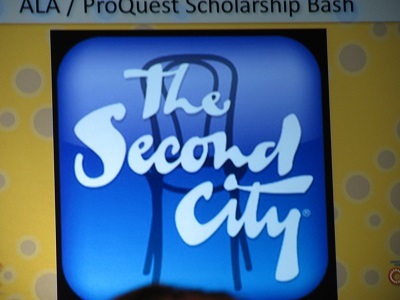 I grabbed some dinner, and then went to the ALA/ProQuest Scholarship Blast where Second City was performing comedy and improv. I was curious about them ever since listening to Tina Fey’s book, Bossypants. It was very funny. I don’t think I’ll probably go to this event in future years unless I find a friend to go with. At the Newbery Banquet and Printz Awards, I always run into several people I know — They’re for the children’s and YA book people. At this, I saw one person I knew, but I think he was on a date. Still, it was nice to not think and just laugh. And that was my big Saturday! More ALA coverage will follow — Writing up helps me consolidate in my mind all I learned and experienced. 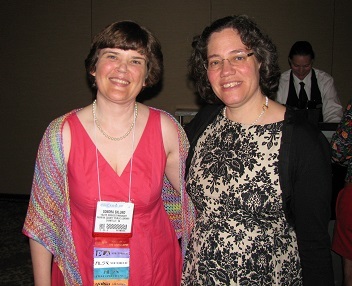 Sunday was one of the highlights of the conference — The Newbery-Caldecott-Wilder Banquet. I took lots of pictures of people dressed up in honor of the Caldecott’s 75th anniversary. Coverage coming soon! 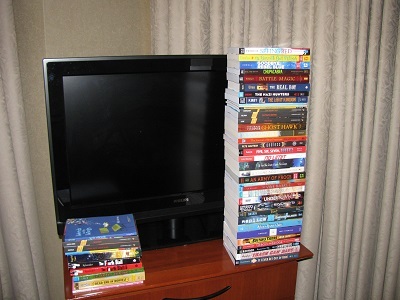 I’m doing a series featuring those authors with 2012 Sonderbooks Stand-outs who have had Sonderbooks Stand-outs before. In other words, my Favorite Authors. Four authors on this year’s list have had a total of 5 Sonderbooks Stand-outs. I’ll begin with the one who wrote my favorite book of 2012, Elizabeth Wein, author of Code Name Verity. I discovered Elizabeth Wein ten years ago in 2003. In my 2003 Sonderbooks Stand-outs, her book A Coalition of Lions, was #1 in Children’s and Young Adult Historical Fiction. Like Code Name Verity, A Coalition of Lions is historical fiction, but it is set in ancient Aksum (Ethiopia) and features the daughter of King Arthur. Technically, this was part of a series, but I thoroughly enjoyed reading it first. But that meant I had to read her others. The next two books, coming before and after A Coalition of Lions were my only two Young Adult Historical Fiction books listed on my 2004 Sonderbooks Stand-outs. I rated the book that follows, The Sunbird, at #1, and the book that came before, The Winter Prince, at #2. In my 2007 Sonderbooks Stand-outs, I included her next story about Telemakos, The Lion Hunter. It was #3 in Historical Fiction for Teens, but that was the year when I didn’t get all of my Stand-outs reviewed. In fact, the sequel to The Lion Hunter, The Empty Kingdom was the only book of hers I’ve read that didn’t make that year’s Stand-outs. And this year she certainly is back among my favorites. I want to highlight here that Code Name Verity was no aberration. I was happy to hear lots of people discussing one of my favorite authors this year! If you haven’t read her Aksum novels, I highly recommend going back and rectifying that situation!